After being put through a gruelling test during the conflict-heightened period, it was Nature lately which unleashed torment on the battered community’s orchards in the form of an early winter snowfall. Amid the gloom and doom situation, a Kashmiri rose to the occasion and showed others a way to tackle the crisis. Whether the method works, only time will tell, but the spirit to not let go is a signature that Kashmir has show in every crisis. For a moment, it appeared as if an overzealous Kashmiri has stepped inside his snow-ravaged orchard to try to salvage the last vestiges of his torn trees. But what the man did shortly became a signature sign of the celebrated resilience that most Kashmiris wear up their sleeves. The video which went viral on social media showed a young Kashmiri fixing a snow-torn tree by using a bolt to bind the tree together. At the same time another viral video showed a youth wailing over his snow-buried apple crop. While the latter video spread sadness, the former uplifted the mood by showing the heart-warming resilience to overcome the odds. In the last 30 years, when the Kashmiri population regularly found themselves hostages in their homes, there were many moments when the natives demonstrated such resilience in wake of disasters and destructions. Be it responding to war crisis with welfare institutions, or keeping the hospitality alive amid brutal military backlash, the resilience manifested almost in every aspect of the life, despite conflict creating its own survival fissures for the population. Binish Sultan was 10, when local youth armed with AK-47s began dominating the streets of her hometown, Downtown Srinagar’s Rajouri Kadal, during the early nineties. The armed uprising against the Indian state in Kashmir soon threw its own challenges for the hostage population in the area. This response wasn’t just confined to the pockets of Rajouri Kadal—the stronghold of the Mirwaiz family—but had equally gripped the other towns and countrified militarised pockets of Kashmir. Years later, when 2008-10-16 civil uprisings in Kashmir would be responded by similar clampdowns by the state, Kashmiris responded to the crisis and helped their worst affected brethren, with both kind and care. While such local resilience has been the hallmarks of the strife-stricken society, there are some standalone occasions, when this resilience became a celebrated collective affair, and made an immediate difference in the society. Perhaps it was the first majorly televised crisis that had hit Kashmir’s hinterland and turned it into a ravaged site—under which lied hundreds of Kashmiris buried. As the post-crisis scenario prolonged and escalated, many Kashmiris—including Langate lawmaker Er Rasheed—starting visiting the quake-hit garrisoned Uri town, with rebuilding material and other assistance. Despite the bitter-sweet experiences with the state aid, the local help—in the form of trusts, NGOs and other welfare bodies—did provide a facelift to the ruined community and helped it to get back on its feet. 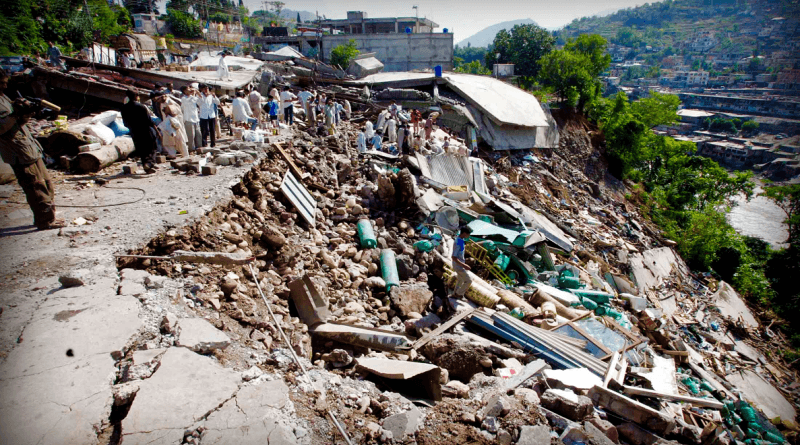 In the devastating fall of 2014, as the Jhelum went berserk, floodgates opened in South Asia’s second oldest city in a matter of minutes, and turned it into a dangerous pool — where cries for help would hauntingly reverberate for weeks together. The scene was no different in K-countryside. Soon Kashmiris—especially youth from Downtown Srinagar—went on volunteer rescue missions along with their brethren from the city suburbs, and saved their flood-trapped brethren caught in the city-side. Even as the Indian army claimed to play a major rescuer (who would later slap a whopping defence bill to New Delhi), it was the local resilience, which mainly thwarted the deluge-inflicted crisis. In the process, some even lost their lives. It reportedly started from Pulwama, which faced a major brunt of gunfights in the post-2010 Kashmir — the phase when the new-age militancy picked up steam in Kashmir. Every time government gunners kill insurgents, they leave behind the signature smoking, gutted residential house. In this process, the host family is rendered homeless. Their neighbours and townspeople then come together to pool money for their new homes. The trend has already entered into the local legends, as the form of yet another celebrated resilience in Kashmir. Before coming to age during the 2016 uprising, curfewed classes had taken roots in the nineties—when an educated section of the society responded to the invasive crisis by volunteering for teaching students in their neighbourhoods. Then, frequent clampdowns would bar students from attending their schools for days and weeks together. But when the trend again picked up at the peak of the 2016 uprising, it was hailed as resilience shown by Kashmiris, when pushed to the wall. As Kashmir’s lingering political problem took centre-stage over the years, many issues were apparently brushed aside. One of the much neglected, yet pressing, is the issue of matrimony. To address the crisis, 2018 saw mass marriages being organised, where collectively around 160 couples tied knots. Such a move has already shown a way to the others, and is likely to become a trend in the coming times. Given their hospitable nature, Kashmiris, on the daily basis, are coming together and rising above their gloom and doom situation. It was the same trait, which was demonstrated by the Kashmiri orchardist lately.